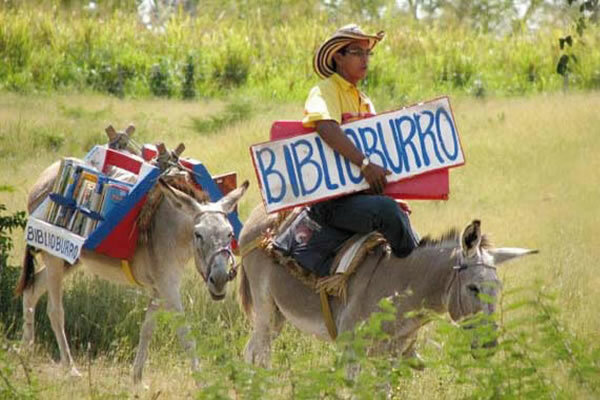 In 1980 the Colombian Ministry of Culture set up an organization of itinerant libraries that would take books to the farthest corners of the country.While library buses had been in place since 1982 in the districts surrounding Bogota, the government deemed it important to reach the inhabitants of the more distant rural regions. For this purpose, large green carrier bags with capacious pockets, that could easily be folded into convenient packages, were devised to transport books on donkeys’ backs up into the jungle and the sierra. Here the books are left for several weeks in the hands of a teacher or village elder who becomes, de facto, the librarian in charge. The bags are unfolded and hung from a post or a tree, allowing the local population to browse and choose. Sometimes the librarian librarian reads aloud to those who have not learned to read for themselves; occasionally a member of a family who has attended school reads to the others. “That way,” explained one of the villagers in an interview, “we can know what we don’t know and pass it on to others.” After the allotted period, a new batch is sent to replace the previous one. Most of the books are technical works, agricultural handbooks and manuals on water filtration, collections of sewing patterns and veterinary guides, but a few novels and other literary works are included. According to one librarian, the books are always safely accounted for. “I know of only one instance in which a book was not returned,” she told me. “We had taken, along with the usual practical titles, a Spanish translation of the Iliad. When the time came to exchange it, the villagers refused to give it back. We decided to make them a present of it, but we asked them why they wanted to keep that particular title. They explained that Homer’s story exactly reflected their own: it told of a wartorn country in which mad gods wilfully decide the fate of humans who never know exactly what the fighting is about, or when they will be killed. Love how you have created a multimedia exhibition here with two images and a long paragraph. The story of the villagers is heart-rendering.